This is a steamy historical romance short story (word count 5,429). Jamie, the Viscount of Richmond, surprises himself when instead of seeing to it that Miranda is punished for trespassing on his land, promises to offer her all the help that she needs to look after her sick mother. Perhaps the answer to his strange behaviour can be found in a set of striking big brown eyes that appear older and wiser than Miranda’s lovely youthful appearance, and which immediately bewitches him, to the point that he longs to take her in his arms. Miranda has always viewed men like Jamie as far removed from her world. He is from a settled ruling class, and she, in comparison, is a wandering traveller with no fixed living location. 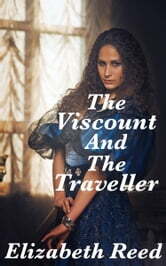 But now she finds herself questioning all that she believes, as the Viscount becomes her protector and continues to treat her with a real kindness. And even more confusing for Miranda are the powerful emotions and feelings that Jamie is able to stir from within her, feelings that make her forget all but the desire that she holds for him!